“The Army’s Starfish Program” seeks to promote decentralization as yet another tool to counter decentralized and networked threats. The day someone becomes CEO of a large corporation, it is classic to warn them about the dangers of hierarchy by saying “yesterday was the last day that anyone will tell you what is actually going on in the company”. 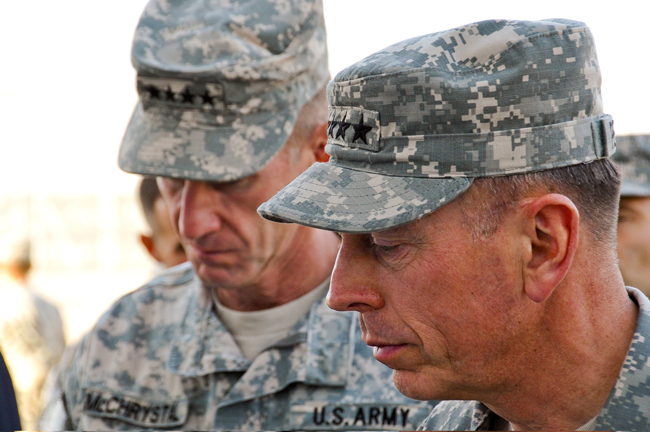 Conventional thinking is that the military is even more hierarchical. In reality, however, it is impressive how the Army is at the cutting edge of non-hierarchical thinking. A good example comes from an article in POLITICO about the book “The Starfish and the Spider: The Unstoppable Power of Leaderless Organizations”. The title is based on the contrasting biology of spiders, which die when their heads are chopped off, and starfish, which can multiply when any given piece is severed — a trait the book’s authors posit is shared by decentralized entities ranging from Alcoholics Anonymous to Al Qaeda to Wikipedia. A New York Times article describes another way the military is exploring non-hierarchical thinking, by working with Greg Mortenson, author of “Three Cups of Tea“. Word of Mortenson’s book spread among military wives, including one who sent the book to her husband, LTC Christopher Kolenda. Kolenda read about Mortenson’s private initiative that built more than 130 schools in Afghanistan and Pakistan, mostly for girls, and he and Mortenson began cooperating. Soon, Deborah Mullen and Holly Petraeus were urging their husbands to read the book. As Colonel Kolenda tells it, Mr. Mortenson and his Afghan partner on the ground, Wakil Karimi, became the American high command’s primary conduits for reaching out to elders outside the “Kabul bubble”. The military has found ways to avoid being like the CEO who doesn’t know what is going on. But they have been careful to ensure that flattening the hierarchy of collecting information doesn’t compromise the hierarchy of command. Gen. David Petraeus stressed this theme in an April 2009 talk at Harvard’s Kennedy School of Government. “You have to be careful . . . it is great to flatten [the organization] for information, but there does need to be a hierarchy when it comes to people pushing recommendations up, pushing policy decisions up . . . you can’t shove aside a subordinate organization and just take it over. When I first met Petraeus in 2006 at an MIT ROTC event, he told me how impressed he was with some of the ROTC graduates who had served with him. He described how he would give out his card to those who particularly impressed him, urging them to email him if they had something interesting to tell him. What is even more impressive than this flattening of the information hierarchy is the way he does so, conveying the impression that he has 5 different ideas as to what is important, and making people feel comfortable bouncing a 6th off him, even if they think he’ll disagree. It is impressive how the military is learning to have a flat information hierarchy, and doing so without compromising the hierarchy of command. Boxer Muhammad Ali might sum it up as “float like a starfish, sting like a spider”. This sophisticated understanding of information flows is a real asset, and it will not be surprising if many in the next generation of CEOs are chosen from people who have absorbed these lessons. Many will have learned the lessons best in the military. The United States may become more like Israel, where prospective employers care as much about what you did in the military as what you did in university. Recently I wrote on the U.S. military’s experimentation with “non-traditional” exercise plans in order to stem the tide of rising obesity within the ranks. However, many have suggested that changes in fitness programs are only half the battle, and that what the military sorely needs is to stop supplying soldiers with nutritionally deficient meal options. Most people are well aware that the military is an excellent option for those looking to serve their country and learn leadership in a demanding and structured environment. Most people are unaware that the military is also the obvious option for those looking to serve their bodies with high calorie and fat laden meal choices. Take for example, the variety of meal options available to members of the U.S. Army and Air Force. The Army & Air Force Exchange Service or AAFES, an agency of the Department of Defense, operates the Post Exchange or PX which carries department store type goods and merchandise for soldiers and airmen. 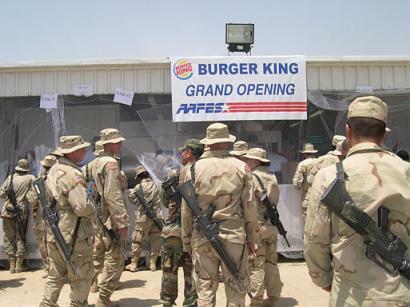 AAFES has signed franchise contracts with such meal providers as A&W Restaurants, Burger King, McDonalds, Cinnabon, Taco Bell, and Pizza Hut just to name a few. Fort Hood, Texas is one of our nation’s largest military posts, and it’s “Mega Food Court,” boasts the following; Charley’s Steakery, Captain D’s, Burger King, and Baskin Robbins. If a soldier can’t make his way to the Mega Food Court there are several Burger King and Charley’s Steakery locations throughout the post. There’s also an Einstein Bagel located at Fort Hood for those soldiers who would like to keep their caloric meal intake for one meal to below 700 calories. This type of disparity in menu options is seemingly uniform throughout the military. The main PX at Fort Stewart, GA offers its own Cinnabon, as well as a Robin Hood, Anthony’s Pizza, Taco John’s, and Charley’s Steakery. In other locations on post soldiers can dine at a Godfather’s Pizza, Popeye’s, or Burger King. What alternatives to soldiers have? Well there is the dependable dining facility. Army regulations mandate that these facilities “apply nutrition principles” and “provide both healthy choices and highly acceptable food items” for each meal. Specifically, the facilities must include choices from each food group from the USDA Food Guide Pyramid, and the caloric value of each menu item must be posted in order to promote healthy food choices. Military members could choose these healthier options instead of the junk food prevalent on military posts and bases worldwide, but they often choose not too for a few reasons. For one, dining facilities are open only at traditional meal times; breakfast, lunch, and dinner, and even then only for ninety minutes. Due to work and other responsibilities many soldiers are inevitably going to miss these times. Second, most soldiers did not grow up eating food in a dining facility type atmosphere and would rather sit in the restaurant style setting they are accustomed to versus the “head-count” and predetermined meal setting from basic training. Military life is regimented and soldiers will often opt for any break from the routine. The military can solve this problem by continuing its commitment to nutrition in dining facilities, and at the same contracting with companies that provide meal options that do not devastate waist lines. Compare the caloric content and meals offered by Burger King, McDonalds, and Charley’s Steakery with offerings from Panera Bread, Jason’s Deli, Au Bon Pain, and Chipotle. Are these companies not willing to operate on military installations, or are we not asking them? The U.S. Military recently recruited the talents of Tony Horton, the creator of P90X, in order to confront increasing obesity among our fighting men and women. The growing obesity problem in the United States has become a national security issue. While the nation stands in the midst of a global “war on terror,” America finds itself too fat to fight. In 2008 only the state of Colorado had an adult obesity rate below 20%. Of the 49 states with adult obesity above 20% thirty-two were above 25% and six were above 30%. These statistics translate into the startling assessment that one in five Americans age 18-34 is obese. In addition, 27 percent of 18 to 24 year olds are too overweight to join the military. This disturbing trend has had a predictable impact on the military where the obesity rate has doubled since 2003. According to the January 2009 edition of the DoD’s Medial Surveillance Monthly Report the number of troops diagnosed as overweight or obese is twice what is was at the start of Operation Iraqi Freedom. Tony Horton has suggested the military include yoga in traditional fitness training. 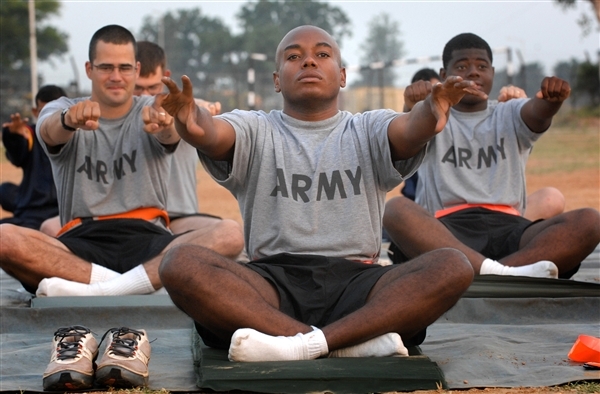 Horton stated that “the days of pushups, sit ups, and long runs in the military are over.” Instead of the usual routine that most soldiers have grown too accustomed to over the years, Horton has suggested yoga because of its ability to lubricate joints and utilize push up or other postures which magnify strength exercises. The military should be commended for taking proactive steps to address obesity within the ranks and insulate the force from the growing disease of obesity. However, more drastic measures may be required. The disturbing statistics demonstrate that the routine morning PT consisting often of hundreds of “side-straddle hops,” and “release runs” is not keeping soldiers in shape. Too often the military has adhered to the strict rule that physical training must be on a field and in a group. Many a young military officer will tell you about trips to the gym after PT or after the work day to maintain the level of fitness their rank requires. The obesity problem and Horton’s statements suggest that physical training must be tailored to keep soldiers fit and lean, instead of focusing on an arbitrary test of the number of pushups or sit ups that can be completed in a two-minute period. Unless the military changes its thinking we will find ourselves booby-trapped by our own gluttony.